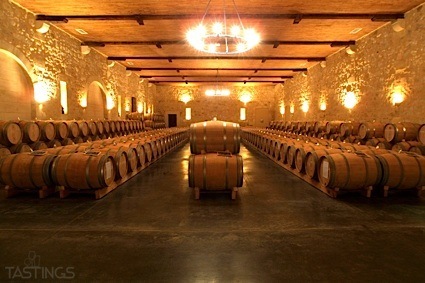 Bottom Line: A rich, fruit-packed red that will be a hit at the table. 84 • Great Freogs 2017 Tanyard Choptank River Vineyards Red, Maryland 13.3% (USA) $35.00. 87 • Great Frogs 2014 Vintner’s Red, Anne Arundel County 13% (USA) $40.00. 90 • Great Frogs 2014 Meritage, Anne Arundel County 13% (USA) $40.00. 84 • Great Frogs 2015 Chardonnay, Anne Arundel County 13.9% (USA) $30.00. 87 • Great Frogs 2015 Vintner’s White, Anne Arundel County 13.9% (USA) $30.00. 87 • Great Frogs 2015 Full Sail Dessert Wine, Maryland 18% (USA) $50.00. 84 • Great Frogs 2015 All Hands on Deck Dessert Wine, Maryland 18% (USA) $50.00. 89 • Great Frogs 2015 Eastport Dessert Wine, Anne Arundel County 18% (USA) $55.00. 84 • Great Frogs 2015 Syrah, Anne Arundel County 14% (USA) $35.00. 89 • Great Frogs 2015 Tanyard Reserve , Maryland 14% (USA) $35.00. 81 • Great Frogs "Lollipop Red" Capital Series, Maryland 18% (USA) $15.00. 91 • Great Frogs NV "Red" Capital Series, Maryland 14% (USA) $20.00. 90 • Great Frogs 2015 "Red" Capital Series, Maryland 14% (USA) $25.00. 87 • Great Frogs 2015 White Capital Series, Maryland 14% (USA) $20.00. 88 • Great Frogs NV Chesapeake Blend, Maryland 14% (USA) $20.00. 86 • Great Frogs NV White Capital Series, Maryland 14% (USA) $25.00. 81 • Great Frogs NV Rosé Capital Series, Maryland 14% (USA) $25.00. 90 • Great Frogs 2015 Harness Creek Vineyard Vintner’s Red Anne Arundel County, Maryland 13% (USA) $45.00. 88 • Great Frogs 2015 Harness Creek Vineyard Meritage Anne Arundel County, Maryland 13% (USA) $45.00. 80 • Great Frogs 2016 Chesapeake White Queen Anne’s County, Maryland 13% (USA) $25.00. 89 • Great Frogs 2016 Tanyard Reserve Choptank River Vineyards, Maryland 14% (USA) $35.00. 83 • Great Frogs 2016 Queen Anne’s County Reserve, Chardonnay, Maryland 13.4% (USA) $30.00. 85 • Great Frogs 2016 Vintner’s White Reserve Queen Anne’s County, Maryland 13.2% (USA) $30.00. 89 • Great Frogs 2015 Harness Creek Vineyard Powatinika Red Blend Reserve Anne Arundel County , Maryland 13% (USA) $.00. 89 • Great Frogs NV Chesapeake Red Blend , Maryland 14% (USA) $25.00. 85 • Great Frogs 2016 Harness Creek Vineyards All Hands On Deck Anne Arundel County, Maryland 18% (USA) $35.00. 86 • Great Frogs 2016 Harness Creek Vineyards EastPort Special Reserve Annapolis , Maryland 18% (USA) $60.00. 84 • Great Frogs 2016 Harness Creek Vineyards Meritage, Anne Arundel County 13% (USA) $50.00. 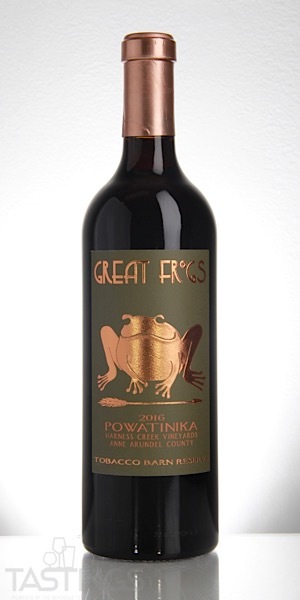 89 • Great Frogs 2016 Powatnika Harness Creek Vineyard, Anne Arundel County 13% (USA) $50.00. 88 • Great Frogs 2017 Cold Blooded Tobacco Barn Reserve Red Blend, Maryland 13% (USA) $45.00. 83 • Great Frogs 2017 Vitner’s White Reserve, Maryland 13.3% (USA) $35.00. 89 • Great Frogs 2017 Vintner’s Tobacco Barn Reserve Red Blend, Maryland 14% (USA) $40.00. 86 • Great Frogs 2017 Harness Creek Vineyard, Chardonnay, Anne Arundel County 13.6% (USA) $40.00. 85 • Great Frogs 2017 Atomic 29 Artisan Collection Red Blend, Maryland 13% (USA) $75.00. Great Frogs 2016 Powatnika Harness Creek Vineyard, Anne Arundel County rating was calculated by tastings.com to be 89 points out of 100 on 11/2/2018. Please note that MSRP may have changed since the date of our review.